This little angel is adorable and can be used as tree ornaments, present toppers or given as small Christmas gifts. Fill the 12 safety pins with the 4 mm pearls, you will need 4 on each pin closing them as you go. 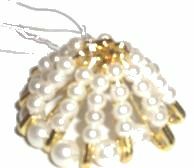 Cut 5.5 inch (14 cm) or wire and thread it through the head of each pin as shown, placing a small 6 mm pearl in between each pin. Secure them by placing them into a circle and securing the wire closed by twisting the ends together. With 5 inches (13 cm) of wire thread it through the ends of the safety pins and secure into a tight circle to form the skirt of the angel. Don’t cut the wire. 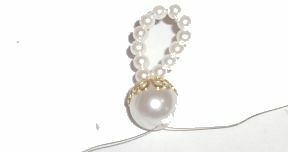 Thread the ends through the large 8 mm pearl to form the body and secure the wire and cut off any excess wire. Cut 15 inches (40 cm)of wire and thread on 12 x 3 mm beads for the halo. Center the beads on the wire and bring both ends of the wire though the bell cap and the 12 mm head bead. Separate the wire and bring one end through each side of the body bead to form the wings. Add 12 x 3 mm beads to each wing wire and bring it back through the body bead to form a loop, then add 3 x 4 mm beads and 3 x 3 mm beads, miss the last 3 beads and thread the wire back up through the first 3 beads. Twist the wire around itself to secure. Do the same thing again for the other wing wire.